Colorado’s electric co-ops are part of a national organization that does energy efficiency research and are watching as two power cooperatives in Minnesota take the lead in advancing clean and efficient student transportation. There are already 90 electric school buses in the North America, one of which will run in Minnesota starting this fall for the 2017-2018 school year. Great River Energy and Dakota Electric Association have partnered with Schmitty and Sons, and are working on securing two more for their school districts in their rural service territories. Cooperatives serve more than 8,000 of the United States’ 13,325 school districts, meaning partnerships like this one between electric co-ops and school districts could provide a nationwide model going forward. The upfront cost of these electric vehicles starts at $325,000, but the potential savings in maintenance and fuel costs each year will be upwards of $10,000 per bus. 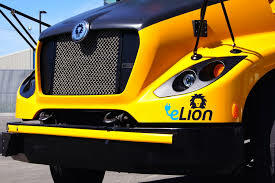 The eLion school bus seats 72 students, and is 100 percent electrically powered. This specific model can go 100 miles, and with the average school bus route in the United States being 60 miles, there is enough range for these electric vehicles to do many of the bus routes (even in cold weather) without having to charge in the middle of the day. It takes four to six hours to charge the bus, and most will charge overnight while taking advantage of lower electricity demand.